Going strong for over two years now, Create Culture has been a staple in the Austin electronic dance music scene, striving to bring you the best in full spectrum mind-manifesting audio/visual bliss every first Wednesday at Empire Control Room & Garage. We scour the globe for the most cutting edge music producers in every genre of psychedelia; combine them with the most driven, colorful, & creative artists we can find of all mediums to create masterpieces right in front of you; throw in a dash of vendors, artisans, audiophiles, jewelers, time jumpers, space toasters, and glitter kitties and we’re well on our way to making the essence of something new, original and ever-evolving. 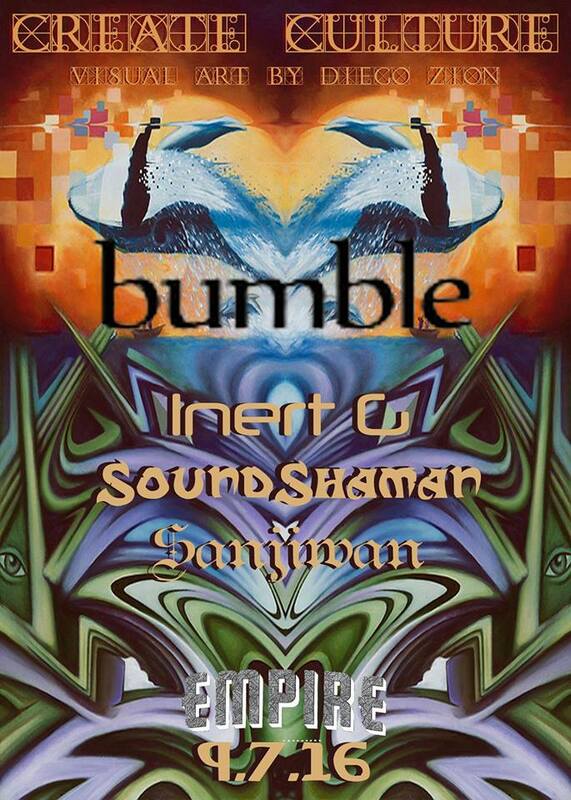 The solo project of Bumble is a hive of vibrations set into the air by an infatuation of audio play. Weaving sonically diverse, bass wobbling, funk centered, glitchy creations. The unifying theme of his music reflect nature, experience, perception and aspires to spark connection. As per venue rules, 18+ requires $5 at the door for entry.